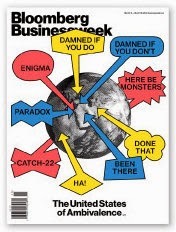 Bloomberg Businessweek is ostensibly a publication meant for a business audience, but I have found in almost every issue a plethora of interesting and well-written features that can be appreciated and enjoyed by the general public too — here's one and here's another. Many months ago the magazine changed certain aspects of the design and layout and began including a snippet of a column on how the cover gets made. Called "Cover Trail", the column gives us a little bit of insight into the workings of the minds of those who decide what the reader gets to see up-front. Far from being a banal discussion, the content of "Cover Trail" is often both intelligent and witty at the same time. "We need the world, with lots of arrows pointing to the world's trouble spots, areas that cause concern for American foreign policy." "So, off the top of my head: Venezuela, Ukraine, Syria, North Korea, Palestine, Israel, Congo, Iraq, Afghanistan. There are more, you know. A lot more." "Could we just highlight areas of the world that aren't problematic for American foreign policy?" "So just one big arrow pointing to moose people in Canada?" "Don't joke about Canada or its mooses. Her frosty attitude is a constant source of strength to me in these long days of winter." "Yeah. Me, too. By the way — do you ever get the feeling that the world's problems never want to be solved and we're all just in a self-supporting cycle of persistent delusion, enabled by a narcissistic impulse to impose incompatible ideologies on our neighbors for a type of political gamesmanship that no one believes in anymore? Our leaders all acting under some imagined oppositional moral pretense when all..."
"And make it look dumb." I just love the snap! crackle! pop! flow of that conversation. To read more "Cover Trail" columns, go here. Incidentally, Commitscion David George (Class of 2005) is deputy editor of the Middle East edition of Bloomberg Businessweek. He has promised to give us his input on how his edition puts the cover together. Speaking of covers, production journalists can learn a lot from reading the views of Fortune India editor D.N. Mukerjea on why good ideas and good writing need to be backed up by good design. And here's New York Times editor Bill Keller explaining how one of the world's great newspapers chooses stories for Page 1. Another good read!